In the chapter on the Russian Revolution in Volume One of Anarchism: A Documentary History of Libertarian Ideas, I included excerpts from the Afterword to Emma Goldman’s My Further Disillusionment with Russia (originally published in 1924). 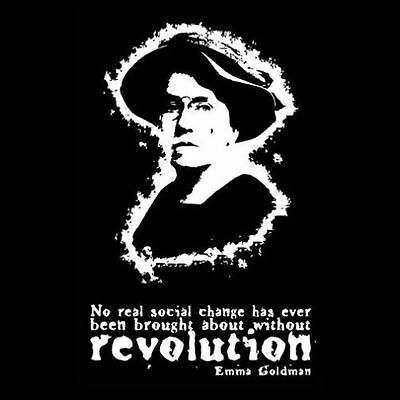 But as Emma Goldman noted in a handwritten inscription to the book, what she was disillusioned with was the Bolsheviks (today known as “Marxist-Leninists”), who had strangled the Revolution, not with the Russian Revolution, which had begun with such great promise. In today’s post, I include the beginning of Goldman’s Afterword, where she refers to the Marxist dogma that a socialist revolution can only occur in advanced capitalist societies, which became an excuse for the Marxist dictatorship in Russia, as the Communists bludgeoned the Russian people into the 20th century. Far from representing the next stage in historical development, the Communist dictatorship in the Soviet Union represented a brutal process of forced industrialization that created a form of state capitalism, paving the way neither for socialism nor communism, but for the restoration of capitalism after the collapse of the Soviet Union (see the article by the the Russian anarcho-syndicalist group, the Interprofessional Workers’ Union, “Russian Capitalism,” in Volume Three of my Anarchism anthology).